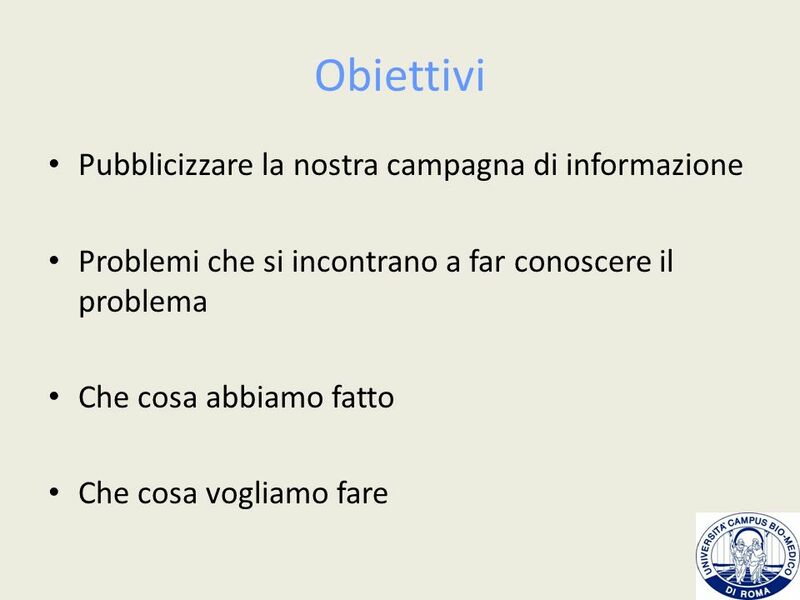 5 Perchè sensibilizzare l’opinione pubblica? 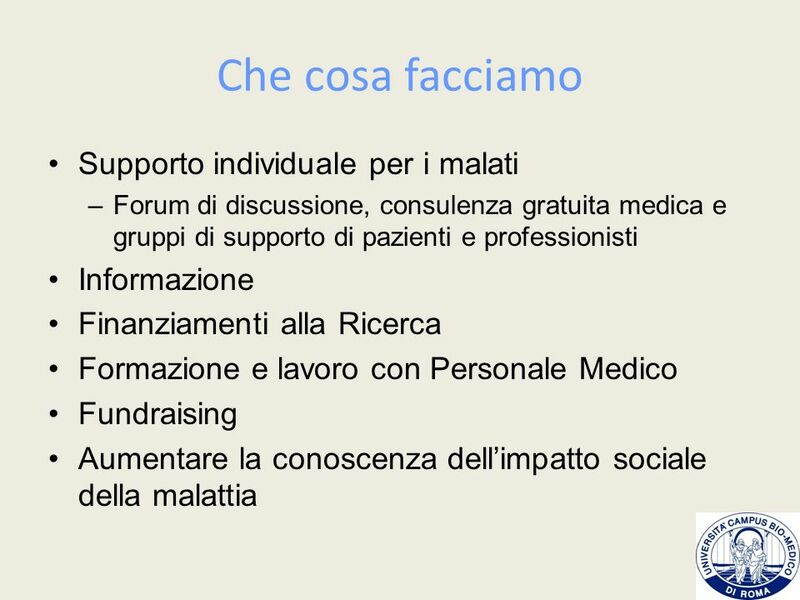 8 Che cosa vogliamo comunicare? 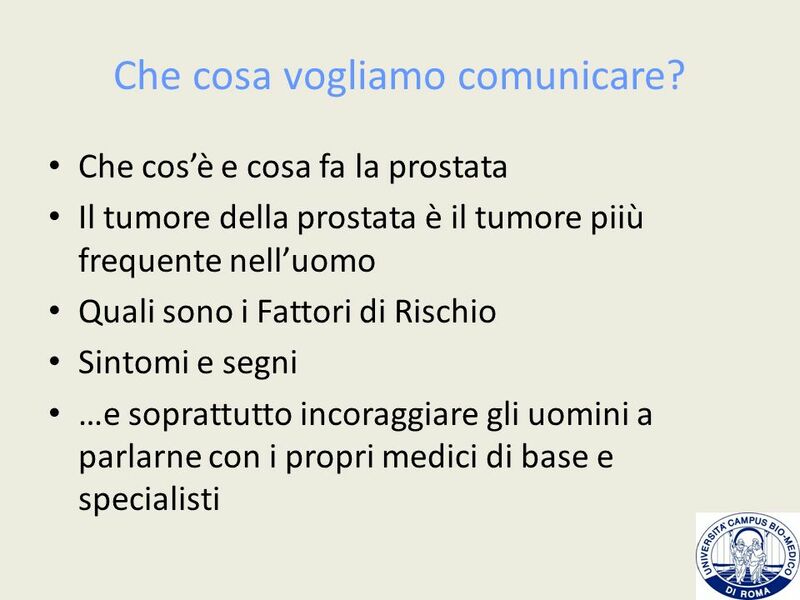 9 Punti Chiave Dov’è la Prostata? 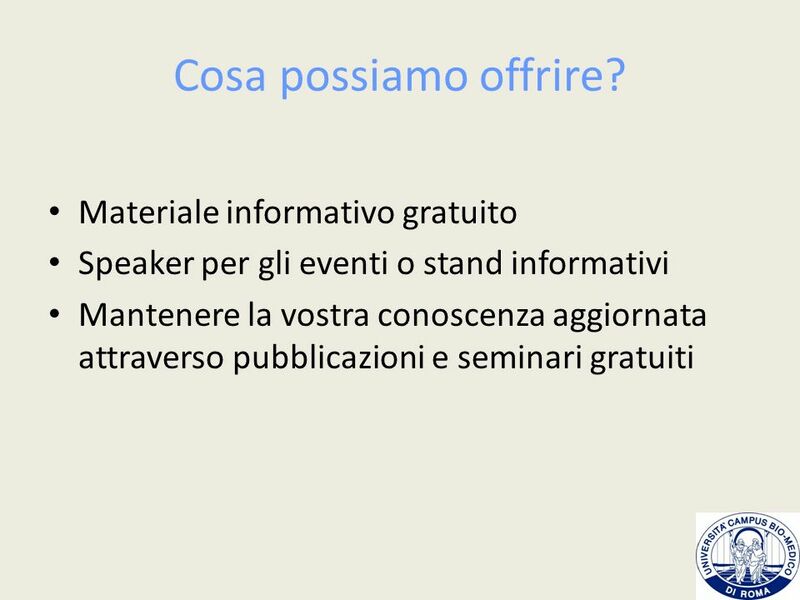 The organisers asked for a quick knowledge update so will have to present this info as being about placing the presentation in context. 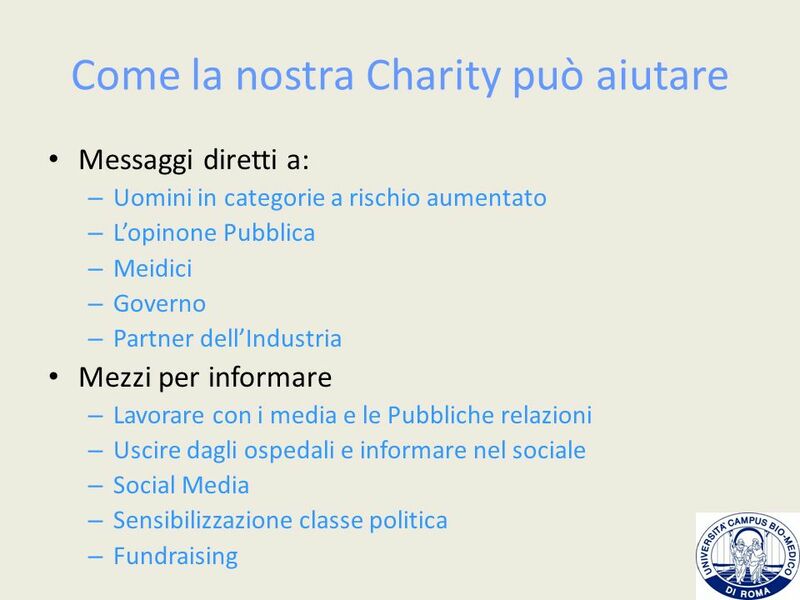 More detailed info available via Charity’s stand. You could always ask the audience if they want one and skip over it if they know exactly what’s what. 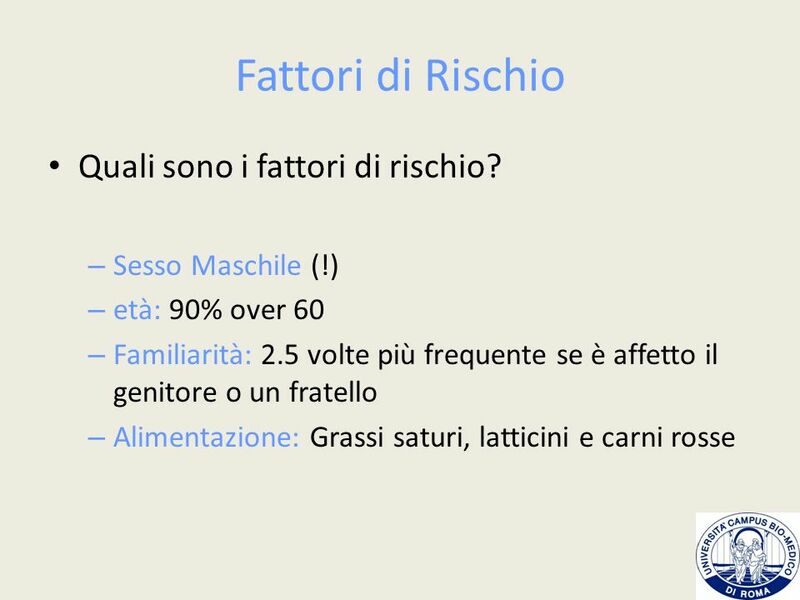 età: 90% over 60 Familiarità: 2.5 volte più frequente se è affetto il genitore o un fratello Alimentazione: Grassi saturi, latticini e carni rosse Age: in Scotland 89% of prostate cancer cases are diagnosed in men over 60.9 • Ethnicity: African Caribbean men are three times more likely to develop prostate cancer than white men. 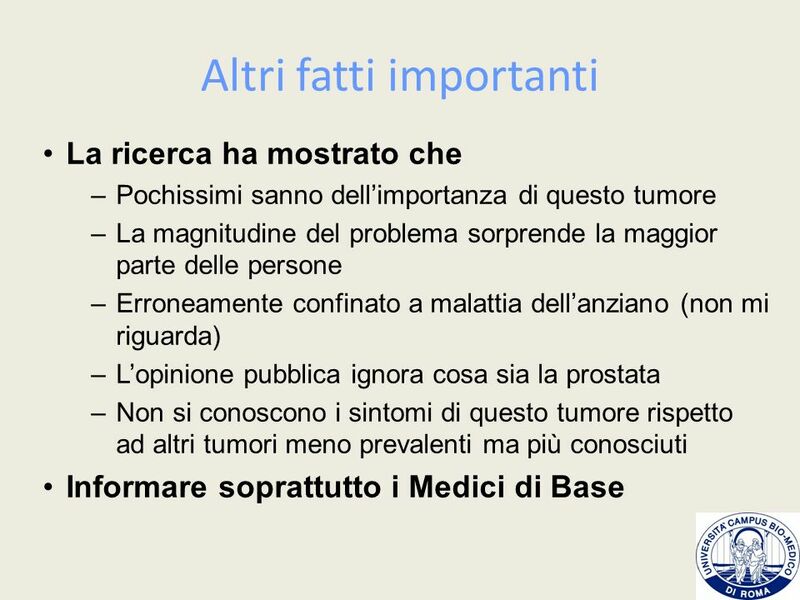 • Family: you are 2.5 times more likely to develop prostate cancer if your father or brother has had it. • Diet: if you have a diet rich in fat, dairy products and red meat, this may increase your risk of developing prostate cancer (and other health conditions). 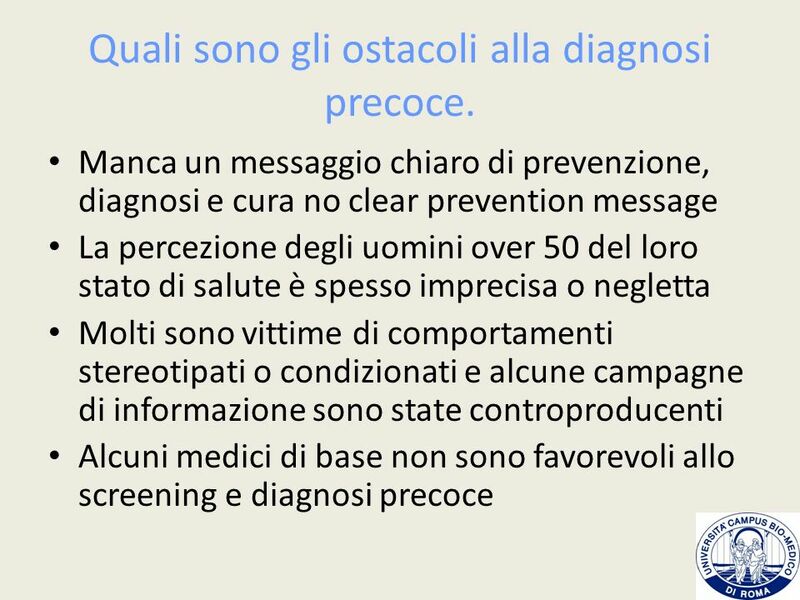 Important to highlight that prostate cancer may cause similar symptoms to non-cancerous prostate problems. 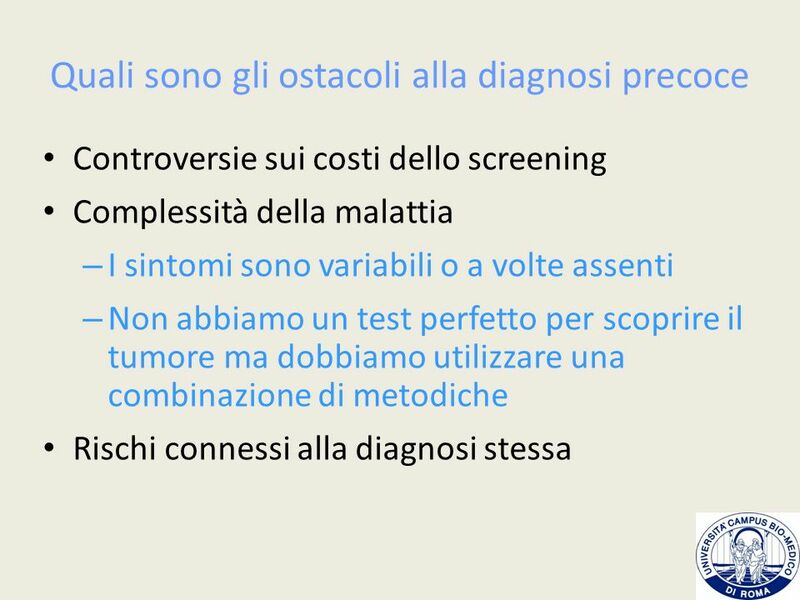 14 Quali sono gli ostacoli alla diagnosi precoce. 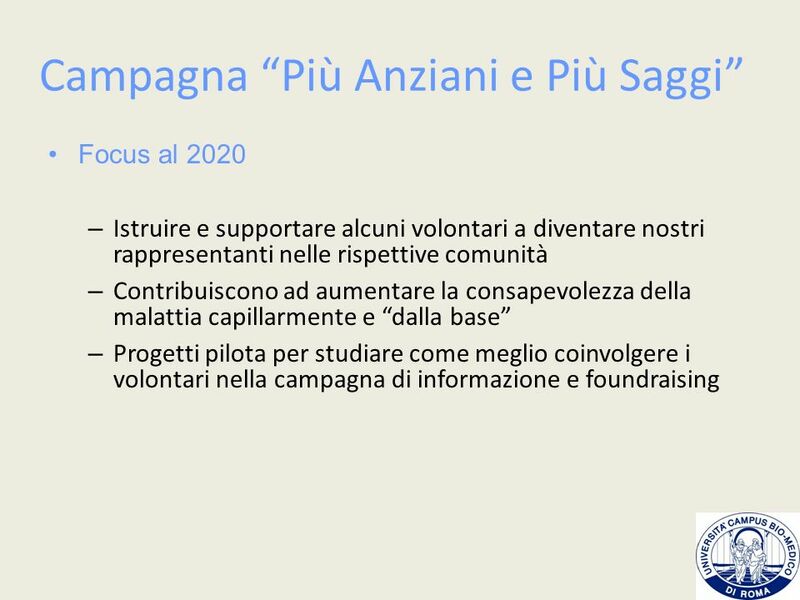 Focus al 2020 Istruire e supportare alcuni volontari a diventare nostri rappresentanti nelle rispettive comunità Contribuiscono ad aumentare la consapevolezza della malattia capillarmente e “dalla base” Progetti pilota per studiare come meglio coinvolgere i volontari nella campagna di informazione e foundraising In 2007 The Charity launched a volunteer programme to train and support men to become community champions to raise awareness within their own community. Funded by the City Bridge Trust, the project initially aimed to train community champions from various black and minority ethnic (BME) groups within six London boroughs. Following findings from the first phase of the project, work in 2009 will now focus specifically on African Caribbean communities in the boroughs of Hackney, Lambeth and Newham. 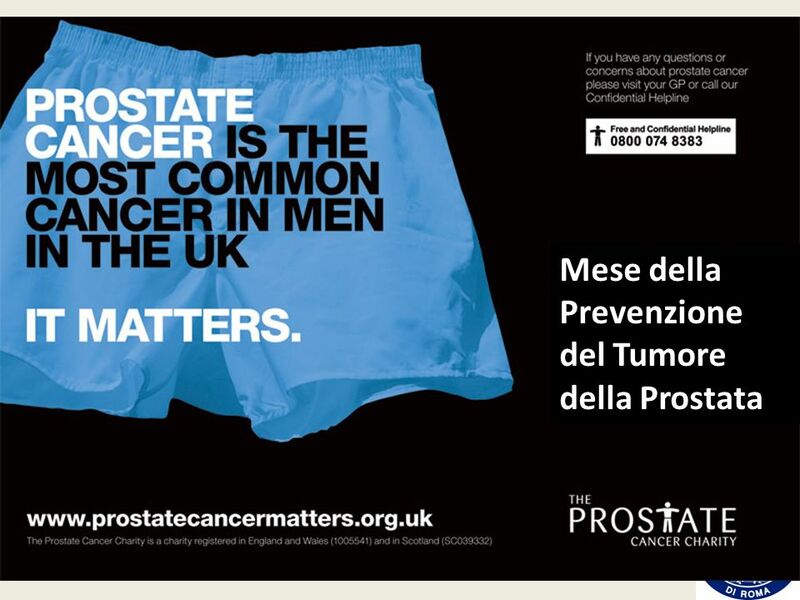 This reflects The Charity’s new strategic goal to raise awareness of prostate cancer within the African Caribbean community due to the higher risk of developing prostate cancer within this group. 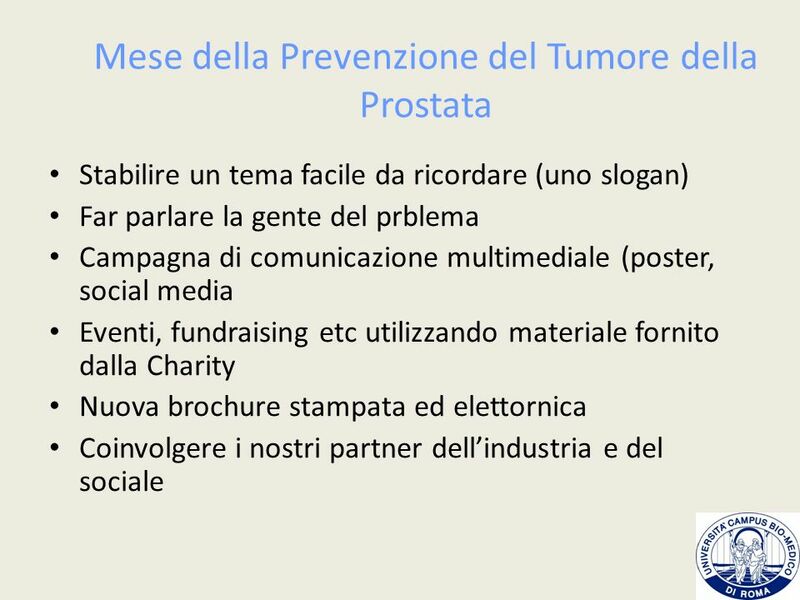 Through close partnership work with community and support groups within the three boroughs, men affected by prostate cancer will be recruited to help raise awareness within their communities. The project will be integrated with our national volunteer training programme, but will be a pilot to investigate the best way to involve and support African Caribbean volunteers in the future. 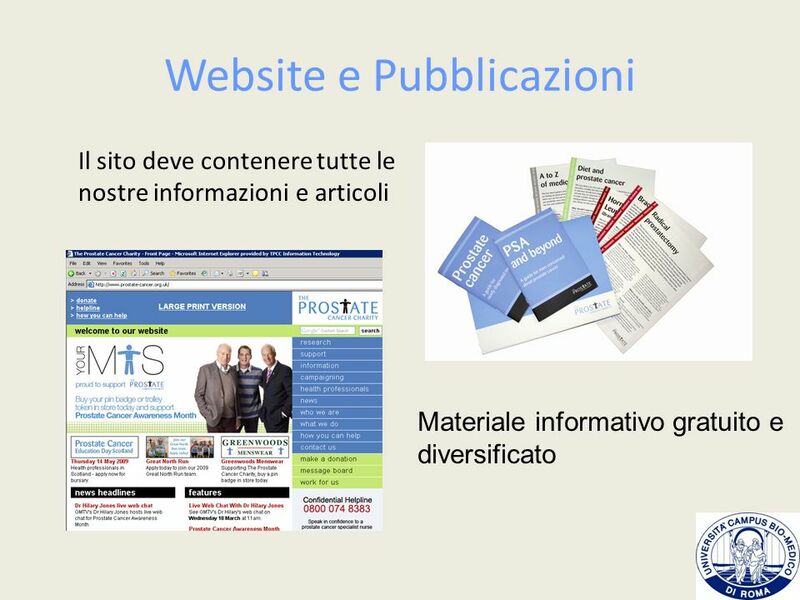 Il sito deve contenere tutte le nostre informazioni e articoli Materiale informativo gratuito e diversificato How many hits does the site receive per year? 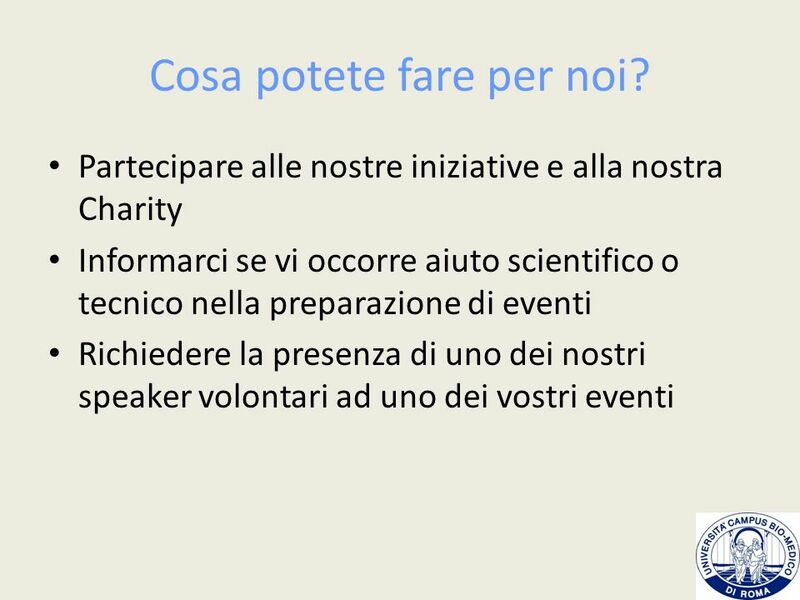 23 Cosa potete fare per noi? 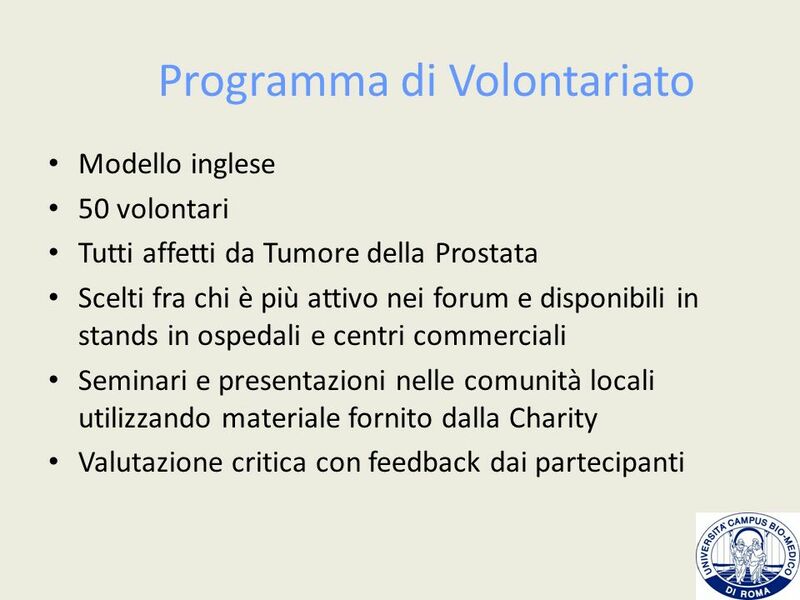 Scaricare ppt "Conoscere il Tumore della Prostata"